Paris - Tens of thousands of protesters in Algeria turned out Friday to demonstrate against the government’s latest attempt to pull the country out of its political impasse, clearly signaling popular rejection of a compromise offer by the army this week. 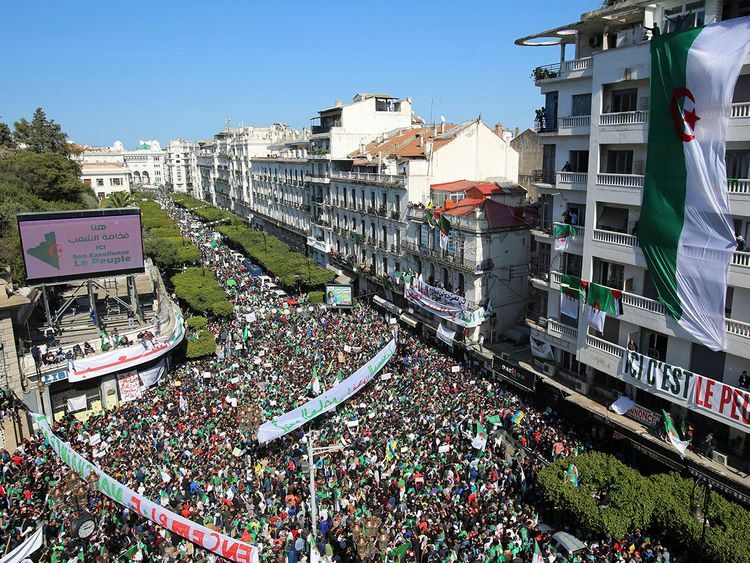 The demonstration, the sixth in a row, appeared to leave Algeria at an impasse: protesters have dismissed the proposal from the country’s most powerful figure, Gen. Ahmad Gaid Salah, the army chief of staff, to sideline the ailing president, Abdul Aziz Bouteflika, install as interim president the head of the Senate, and hold elections. What happens next is unclear, but some opposition figures said it was now up to the government to make what one called a more serious offer. The crowds in the streets, increasingly pressing in their demands, want the wholesale removal of what they call “the System” - everyone associated with Bouteflika’s 20-year reign. So far the government has given no sign of conceding. In proposing Bouteflika’s removal, Gaid Salah, who had been the president’s staunchest ally, went beyond what many had expected. But by invoking Article 102, of the Algerian Constitution, a section that calls for the removal of the president if he is found unfit, the general left the rest of the ruling “System” in place - unacceptable in the eyes of many Algerians. Algeria’s politics, frozen under Bouteflika, with an acquiescent populace cowed by the prospect of a return to the chaos of the 1990s civil war, is the most unsettled in many years. The demonstration Friday was the biggest yet, observers there said, with a more determined crowd than ever. Protesters held up signs playing on the French for “102” - which spoken out loud sounds like “Without two” - and the signs carried portraits of Bouteflika and his influential brother, Said, whom many say is the regime’s real string-puller. Critics of the government said the size of Friday’s crowds left no doubt that Gaid Salah’s offer was unacceptable. “This was a response to the proposal to apply the 102, which would leave the symbols of the current system in place to manage the transition,” Mustafa Bouchachi, a human rights lawyer in Algiers who has emerged as a leading opposition figure, said. Whether the demand for a wholesale housecleaning is realistic remains to be seen. Large vested interests, financial and political, are at stake. Many in the ruling elite, including in the army, have profited hugely from sweetheart deals, favourable loans by state banks and the state’s largesse. Many of Bouteflika’s erstwhile allies have deserted him in recent weeks as the demonstrations have gained the upper hand. Words that could have landed their speakers in jail five months ago have suddenly become acceptable. Gaid Salah himself has praised the demonstrators’ patriotism. But that does not appear to be enough. His “offer is rejected from top to bottom,” said Abdul Momin Khalil, general-secretary of the Algeria human rights league, from Algiers. “The citizens have understood that 102 simply means a rearranging of power, and not a democratic transition, that will allow the establishment of a new republic, and above all, new people,” said Khelil.